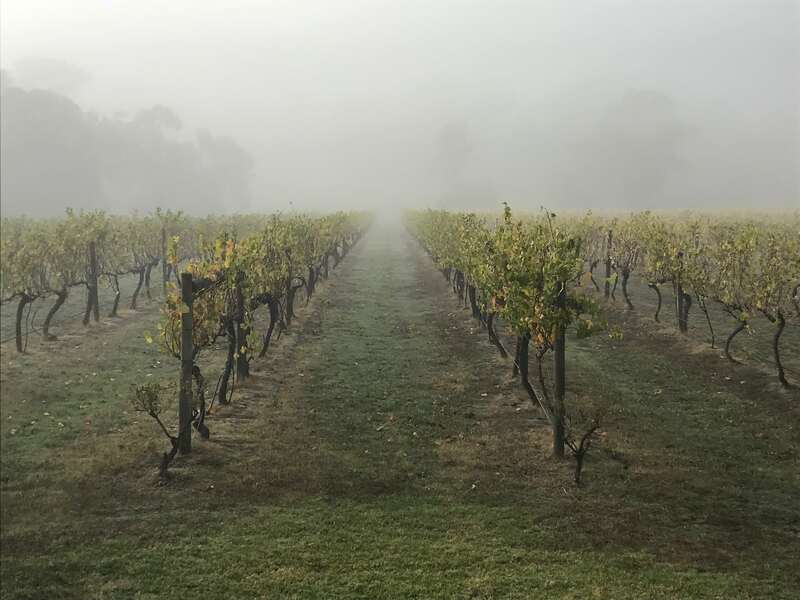 Winery Spotlight: Steel's Gate Wines - Australian Wine Tour Co.
Tucked away in one of the most beautiful, misty and serene parts of one of Victoria’s most famous wine regions, the Yarra Valley, is Steel’s Gate. A boutique vineyard housing decades-old chardonnay, shiraz, cabernet sauvignon and pinot noir grapevines in the still, idyllic setting of Steel’s creek. Steel’s Gate is surrounded almost entirely by National Park acreage, which further adds to the feeling of complete serenity. For this month’s Winery spotlight, we caught up with owners and operators, Matthew and Brad, to discuss the history of Steel’s Gate, what the winery has to offer its visitors and to chat about all things wine! Tell us a little about the winery’s history? Steels Gate is a boutique vineyard and winery located in Steels Creek, Victoria, Australia. Almost completely surrounded by National Park, this 82-acre (33 hectares) property grows Chardonnay and Pinot Noir grapes across 6 acres (2.5 hectares) of vines mostly planted in the late 1970’s. Steels Gate was established in 2009. Situated in a picturesque hillside setting at Dixons Creek, Shantell Vineyard and Restaurant is located just 60km from the heart of Melbourne. Shantell Vineyard has 13 acres (5 hectares) of Chardonnay, Cabernet Sauvignon, Shiraz and Pinot Noir vines mostly planted in the late 1970’s. What wine varieties do you specialise in? Pinot Noir, Chardonnay, Blanc de Blanc, Pinot/Chardonnay Sparkling, Pinot Noir Rose, Cabernet Sauvignon, Shiraz, Semillon. Can you tell us a little bit about your winemakers/winemaking process? Having managed the viticulture on their Home Block vineyard for the past 9 years, Matthew and Brad make wine that expresses the natural characteristics of the fruit from each site. Premium wine starts with a well-managed vineyard. “Everything we do is by hand, from cane pruning to pressing wine and bottling”. Do you have an on-site restaurant, or do you offer any food tastings? Yes, we have an on-site restaurant that overlooks the Shantell Vineyard. We don’t offer food tastings but do have a one and two-course lunch menu available for groups. Do you cater for special events? Yes. Byron and Jane manage the food side of Shantell. With a combined 50+ years’ experience in the hospitality industry, their food philosophy centres around using fresh and local produce and keeping the menu beautiful and simple. “There is nothing more rewarding than friends coming together to share wine, food and laughter” – that’s the driving force for this family of foodies that look after all the food at Shantell. Having a full-catered kitchen means we can cater for almost any occasion. Ranging from bespoke cooking classes in our kitchen (overlooking the vines) to private dining with wine tasting, through to small weddings. Not to mention…. Imagine dining outside right amongst the vines. Even on a chilly Yarra Valley afternoon, so long as the sun is shining, it is an absolute delight (and don’t worry, we have a location in-doors with a stunning view of the Valley if Mother Nature is against us when you visit!). 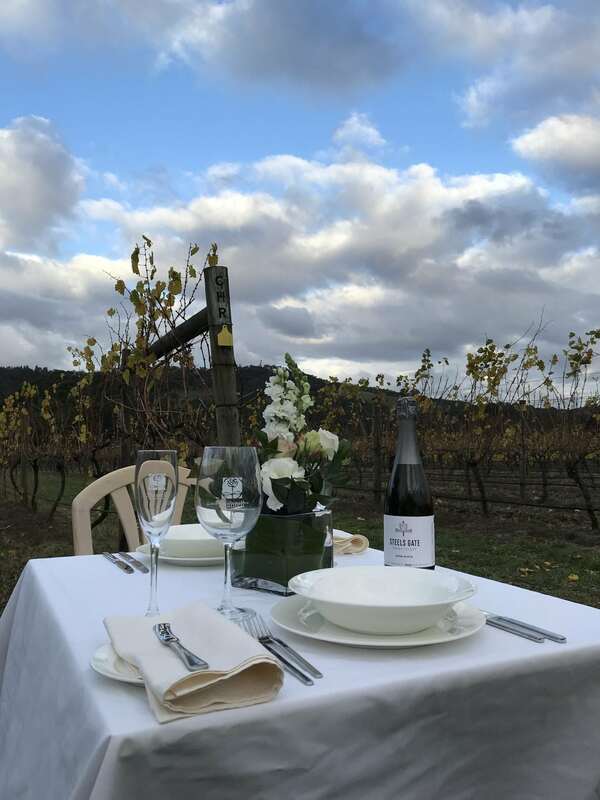 After a private personal tasting experience hosted by one of the owners Brad Atkins or Matthew Davis of Steels Gate Wine, you will move to a private table amongst their 40-year-old grape vines. Rated by many who visit the Steels Gate @ Shantell cellar door and restaurant as “the best views in the Yarra Valley”, you will be treated to a 3-course meal with beautifully matched wines. Food is prepared on site by their expert Chef Byron More using local ingredients and whenever possible grown on site. Colours are always amazing, whether it is the autumn leaves on the vines, the late sun reflecting off the mountains and clouds, or the rainbows across the valley sky. The subtle touches are not overlooked, with complementary throws provided in case the sun does not provide sufficient warmth during your unique dining experience. What makes your winery stand-out against the other vineyards in the area? We don’t overbook to ensure an outstanding experience. Do you offer on-site accommodation? Are there any attractions located near you that you would recommend to visitors? Chocolateries is just 2 min down the road. Where can you find Steel’s Gate?